By common knowledge, Adam is an archetypal figure of creation. But what is most important about him is not his status as having been created by God, but of instituting the ‘meaning of the world’ through his own creative act. In short, Adam institutes a world. But how might an abstract painter render such creative agency pictorially? Perhaps Onement I acquired significance for the artist because as it assumed a ‘life of its own’ – a result not only of Newman’s practical or technical activity but also his creative act – the status of his act (painting) in relation to its consequences (work of art) became increasingly evident to him. Newman’s act instituted a meaning that seemed self-governing, at once originated by, yet independent of, himself. From this perspective, a creation of the self – creating something out of the self – follows the structure of parentage. The child is ‘of’ the parents not in some proprietary sense, but is autonomously himself or herself. Newman’s act as an originator – and the new relationship to the painting he originated by his act – was metaphysical in the sense that it disclosed an openness, an immanence that was embodied in and through Onement I. Of his decision not to pull the tape upon which he had applied his test colour to make the picture’s central band, Newman said in a 1970 interview with film director Emile de Antonio: ‘That stroke made the thing come to life for me.’9 That recognition was grounded by Newman’s practice as an artist, which taught him that just as no technical plan was necessary to make a painting (‘I don’t paint in terms of preconceived systems’, he also told Sylvester), no template necessarily controlled the course of human action nor predetermined its consequences.10 Onement I made visible the imbrication of expression and implication. When interpreting artists’ interview statements, one must guard against ascribing to isolated phrases a deeper significance than would normally be implied in conversational dialogue. But in Newman’s case, attributing philosophical heft to even his minor pronouncements seems at times warranted: a notoriously obsessive wordsmith, not only did he repeatedly revise his writing for publication until each phrase carried the weight he intended, he also amended interviews after the fact.11 In Newman’s remarks to de Antonio, one locution resonates particularly strongly with the analogy of creation that the artist’s account of Onement I inaugurated: ‘That stroke made the thing come to life for me.’ He was referring, as I said above, to the central band of orange-red that bisects the field. Although the variable density of paint along the line’s length and its relatively irregular edges suggest that it was laid on the surface with multiple touches, Newman seems to have considered its final appearance singular, one ‘stroke’. Given his testimony that Onement I suddenly confronted him with consequences he could not avoid, we might hear in that word connotations both of a forceful blow (being struck physically or psychically) as well as of a temporal moment (the striking of a clock). The conjunction helps draw our attention to the difference in Onement I between Newman’s sequential and thus protracted technique of marking his canvas surface as a ‘thing’, and the completed painting’s immanent pictorial order, its ‘life’. If we pursue Newman’s exclamation that his stroke made Onement I ‘come to life’, we might take the metonymic substitutions sponsored by the stroke-brush-finger triad to evoke a specific art historical association. In what has become perhaps the most famous image of creating human life in the Western canon – Michelangelo’s The Creation of Adam c.1508–12, painted on the ceiling of the Sistine Chapel in Rome – God reaches out with his index finger poised to touch (to stroke?) Adam’s finger. Upon contact, Adam’s life will begin (and allegorically, all life, all opportunity for human content to become manifest in the world). It would be unwise to insist that Newman was specifically responding, either in Onement I or in Adam, to this premier Renaissance precedent – at least, not on any customary level. Still, the ambition to confront the major achievements through which artists in the past had given form and expression to their historical experience and its creative horizons was fundamental for Newman and his peers. In his tour of the Louvre with Schneider he confessed: ‘I feel related to this, to the past. If I am talking to anyone, I am talking to Michelangelo. The great [artists] are concerned with the same problems … Saying something about life and about [humanity] and about himself: that’s what a painter is about.’25 Because he had committed himself to abstraction, another way to put Newman’s self-imposed task would be to say that, at least in the case of Adam, expressing ‘creation’ under contemporary conditions required the elimination of iconography, but the preservation of an image that could convey its significance as powerfully as it traditionally had been conveyed by representational and symbolic means. Onement I points to something. It is difficult to assess, in the face of Newman’s reticent paintings, how to take his claim that they can be ‘understood by anyone’ – as if considerable interpretative effort were not involved. Is Adam’s ‘revelation’, as a painting or a motif, ‘self-evident’? It is doubtful. To think so would imply that the labour of interpreting Newman’s artistic statement is unnecessary, since what is self-evident or revealed is comprehended immediately. But while Newman and his colleagues clearly prized the notion of a powerfully intimate relationship between the viewer and a painting, between the self and another, they recognised that the metaphysical moment of contact between the two parties was on the order of communication, not identity.27 It would be a mistake, too, to misread Newman’s bold mandate for a ‘real and concrete’ image as a blanket assertion for the ‘actual’ over the ‘pictorial’. That would be to convert the painting that is a virtual medium for the artist’s feelings into a literal object that is nothing more than stimulus for an automatic response. It would also transform the act of beholding the painting with an eye towards understanding another’s feelings (‘seeing’, as he put it) into an occasion for experiencing one’s own feelings (merely ‘looking’). On the contrary, Adam’s ‘revelation’, as yet unknown to us, is expressed within a medium that is constrained by certain historical conventions, and to understand what that revelation is – what Newman’s meaning is – requires us to maintain a distinction between the metaphysical implications of the work of art and the viewer’s basic experience of the thing.28 It also calls for an interpretive approach flexible enough to align a painting’s pictorial effects and the mode of address to which they give rise with other dimensions of Newman’s thinking, writing and practice – chiefly, his often retrospective assessment of what constituted the essence of his art. Attend closely to the phrasing that Newman, with the precision characteristic of his oratory, chooses to employ. His titles are intended to correspond not to a feeling stimulated in us by the object of our perception (that is, to an affective reaction to the physical canvas before which we stand), but rather to the meaning of Newman’s feeling that the painting is meant to express. To what human content or feeling, then, does the title ‘Adam’ metaphorically correspond? My attempt at an answer requires a rather protracted detour. Newman’s segue from Adam to Vir Heroicus Sublimis, I would like to suggest, indicates less a redirection than a significant association (going forward, keep this shift in mind, as it will figure largely in a claim I will soon make). It is as if the two works were coupled in the artist’s mind. This is perhaps unsurprising, given that these were the only two works he modified after their original completion.33 Additionally, the economy of his body of work – just 118 works on canvas – facilitates cross-references and connections. Art historian Yve-Alain Bois has gone so far as to suggest that Newman’s works are so intentionally restrained, non-redundant and internally related that as a set they are a ‘structural totality’, like a deck of cards, within which ‘each card has a distinct role to play while forming specific links with various other cards’.34 Finally, Vir Heroicus Sublimis and Adam featured together in Newman’s second solo exhibition at Parsons in 1951, neither yet being named. But there is another reason why Newman may conceptually have paired them by the time of his interview with Sylvester in 1965. Four years earlier, in 1961, Newman took Erwin Panofsky to task in Art News for comments the art historian had made regarding the Latin title of Vir Heroicus Sublimis. The issue concerned a misspelling in an article by another art historian (and curator), Robert Rosenblum: the typesetter had rendered the work’s title Vir Heroicus Sublimus (with a ‘u’ instead of an ‘i’) in the caption to its illustration. The mistake ignited a fiery exchange. In round one, Panofsky questioned Newman’s knowledge of classical languages and deprecated the artist by suggesting that he must think of himself, like God, to be ‘above grammar’ (a characteristic attributed to the deity by Aelfric, a medieval monk).35 Newman marshalled his artillery. In a letter to the editor, he pointed out that had Panofsky read more closely, the scholar would have concluded that the misprint was a typesetting mistake (since the main text of the article included the work’s correct spelling). But the artist did not stop there. In a manoeuvre typical of his propensity for brinksmanship, he raised the stakes of the debate. He advanced into his enemy’s territory, arguing against the renowned Panofsky – whose far-reaching scholarship and comprehensive training in classical languages was seemingly beyond challenge – that the misspelling, Sublimus, was also correct. How so? The final Latin phrase stems from Horace, and refers to the privilege of poets and painters to risk everything in the realisation of their art, a project that – as the prefix aud, signifying hearing and listening, suggests – can assume the form of oral address to an audience. Thus, in his exchange with Panofsky, Newman establishes the grounds according to which even the putative misspelling of his painting’s title can be understood to denote a dimension of its human content – a meaning captured by the inspired and significant link Newman draws between Vir Heroicus Sublimis and the head or skull of ‘man’. In depictions of the Crucifixion, the skull is a synecdoche – a part that represents a whole. The skull stands for the entire body, and in doing so visualises the structural relationship between the fall of the old Adam and his salvation by the new. Jesus Christ, as the art historian Gertrud Schiller explains, ‘atones on the Cross for the state of sin against God in which mankind has persisted since Adam. The new Adam dies above the grave of the old Adam, [so] that the old may live.’44 Such associations are deeply embedded within the eschatological account of sin and salvation, personified by doubled figures of the ‘first man’ (Adam) and the ‘second Adam’ (Christ). Although for the Jewish faith Adam is not understood to prefigure Christ, did Newman – through his Jewish upbringing and certain knowledge of Christian iconography – ponder such connections during long periods of reflecting on the implications of his art? It is possible, even likely. At the very least, they could have served as a kind of tacit background against which his reflections, and perhaps some of his actions, unfolded. They also could have affected the naming of previously untitled paintings after religious figures, for instance Abraham 1949 (Museum of Modern Art, New York) and Joshua 1950 (private collection), or events of a religious nature, such as Covenant 1949 (Hirshhorn Museum and Sculpture Garden, Washington, D.C.) and Concord 1949 (Metropolitan Museum of Art, New York), the latter of which hints at the state of harmony enjoyed by Adam and Eve before the Fall.45 Still, attributing a specific reference to Adamic typology to the finer points of Newman’s account of Vir Heroicus Sublimis remains speculative. Yet before abandoning the line of inquiry, consider another piece of evidence that might help confirm something like the structure of implication I have been tracing. Surprisingly, there is in Newman’s body of work a second ‘Adam’. The painting is now designated as Untitled 1, 1950, but has also been referred to as Adam #2 (fig.4). This work is one of the six narrow canvases Newman completed in 1950. The set includes the extremely attenuated The Wild 1950 (Museum of Modern Art, New York), which hung directly across the room from Vir Heroicus Sublimis at Betty Parsons Gallery, New York, in 1951, where Tate’s Adam was exhibited without its third band. Untitled 1, 1950 is around ninety centimetres high, and although only fifteen centimetres wide, it comprises a complex sequence of verticals. A heavy band of bright orange paint, applied at least in part with a palette knife, declares the left edge of a constricted cadmium red field that exhibits subtle variations in shading. The slender area to the right of the orange band is pierced by a pure white line which appears unpainted (that is, it seems to be the sized and primed ground of the canvas surface itself, revealed when Newman removed the tape that masked its length). The brilliant zip wavers slightly along its stretch, but nonetheless tautens the plane, giving the slim field an impression of being tightly pulled together despite the variability of the painting’s composition and internal modulation. At the same time, the white filament helps to make visible by contrast a pair of shaded striations on either side running parallel to it – dusky vertical patterns that are initially hard to see but that come into view, I almost want to say, like shadows cast from some remote source against the zip’s illumination. Upon close viewing, these sooty lines can be seen to bracket another, almost ‘invisible’ zip, whose presence is revealed slowly. It would be imprudent for me to insist that, as a pair, Adam and Adam #2 somehow recapitulate the typological doubling of Adam and Christ. Yet as evidence accrues of Newman’s sensitivity to religion as a traditional symbolic form – one that preeminently organises and narrates various metaphysical aspects of human experience – the possibility grows that he considered his abstract paintings to express, however obliquely, certain Judeo-Christian motifs; and moreover to relate, in some heretofore unremarked ways, to the means by which artists in the past had represented those motifs in visual art. (Recall the relationship I proposed between Onement I and Michelangelo’s Creation of Adam.) Clearly, there appears in Newman’s paintings no traditional iconography or symbolism through which to communicate such themes. However, with reference to other aspects of Newman’s practice as an artist and thinker – namely photography – we may yet discover the means by which he brought the salience of traditional symbolism into alignment with his pictorial goals. 1. Barnett Newman, ‘The First Man was an Artist’ , in John O’Neill (ed. ), Barnett Newman: Selected Writings and Interviews, Berkeley 1990, p.157. 3. Barnett Newman, ‘Interview with Emile de Antonio’ , in O’Neill 1990, p.306. 4. See Michael Leja, ‘Adam and Newman’s Beginnings’, in Michael Schreyach (ed. ), In Focus: ‘Adam’ 1951, 1952 by Barnett Newman, July 2018. 5. Barnett Newman, ‘Interview with David Sylvester’ [1965, revised 1972], in O’Neill 1990, p.256. See also the gloss of Newman’s account given in Thomas B. Hess, Barnett Newman, exhibition catalogue, Museum of Modern Art, New York 1971, pp.51–3. 8. Ann Temkin, ‘Barnett Newman on Exhibition’, in Ann Temkin (ed. ), Barnett Newman, exhibition catalogue, Philadelphia Museum of Art, Philadelphia 2002, p.34. 11. For indications of Newman’s editorial micromanagement – and for a stunning example of the productive results of scrutinising the word-by-word texture of Newman’s utterances – see Richard Shiff, ‘Whiteout: The Not-Influence Newman Effect’, in Temkin 2002, pp.76–111, especially pp.81–3, p.89, p.108 note 117 and p.110 note 186. 12. Barnett Newman, ‘Interview with Karlis Osis’ , unpublished transcript, Barnett Newman Foundation Archives, New York, p.17. 14. On the fraught status of the ‘act’ in the post-war period, see especially Fred Orton, ‘Action, Revolution and Painting’, Oxford Art Journal, vol.14, no.2, 1991, pp.3–17; and Nancy Jachec, ‘“The Space between Art and Political Action”: Abstract Expressionism and Ethical Choice in Postwar American Art, 1945–1950’, Oxford Art Journal, vol.14, no.2, 1991, pp.18–29. 15. Newman added the third central vertical band to the painting in 1952, having notionally completed, and already exhibited, the painting in 1951. For elaboration, see Michael Schreyach, ‘Scale and Standing’, in Schreyach 2018. 16. Newman recalled of painting Abraham 1949 (Museum of Modern Art, New York): ‘The terror of it was intense … I call it terror. It’s more than anxiety … Where do I get the nerve[?] … What’s going to happen? One is in the presence of a kind of presence: oneself’. Newman 1963, pp.15 and 20. 17. Art critic Clement Greenberg articulated the pictorial (not actual) effect of experiencing an arrested temporal instant in paintings like Newman’s: they are ‘all there at once, like a sudden revelation … You are summoned and gathered into one point in the continuum of duration … You become all attention, which means that you become, for the moment, selfless and in a sense entirely identified with the object of your attention’. Clement Greenberg, ‘The Case for Abstract Art’ , in John O’Brian (ed. ), Clement Greenberg: The Collected Essays and Criticism, Volume 4: Modernism with a Vengeance, 1957–1969, Chicago 1993, p.80. 19. On Newman’s delayed fame, and his charged relationship to his influence and legacy, see Shiff 2002, especially pp.78–83. 20. Barnett Newman, ‘Through the Louvre with Barnett Newman by Pierre Schneider’ , in O’Neill 1990, p.301. 21. For Hess, the line-as-beam-of-light symbolised the identity of the Creator and the Created as professed by Jewish Mysticism (see Hess 1971, p.53). Hess appropriates the symbolism of a beam of light from Gershom G. Scholem, Major Trends in Jewish Mysticism , New York 1954, p.27 – an author whose other books are held in Newman’s library. Hess’s monograph departs considerably from the tenor of his earlier book, Barnett Newman, New York 1969. The 1971 volume was published after the artist’s death, and has been criticised on the grounds that Hess’s own interest in the Kabbalah came to dominate his account of the secular-minded Newman (see Yve-Alain Bois, ‘Here to There and Back’, Artforum, March 2002, p.103). Whether or not Newman would have agreed precisely with Hess on the line’s symbolic content, Richard Shiff has proposed that Newman likely associated any light-valued vertical band against a darker ground with a streak of light on the basis of Hess’s notes for the 1969 monograph (see Shiff 2002, p.109 note 135). 22. Jean-François Lyotard, The Inhuman: Reflections on Time, trans. by Geoffrey Bennington and Rachel Bowlby, Stanford 1991, p.82. I am deliberately underplaying the role ‘difference’ and ‘division’ plays in Lyotard’s account. The full quote reads: ‘The titles of many of [Newman’s] paintings suggest that they should be interpreted in terms of a (paradoxical) idea of beginning. Like a flash of lightning in the darkness or a line on an empty surface, the Word separates, divides, institutes a difference, makes tangible because of that difference, minimal though it may be, and therefore inaugurates, a sensible world.’ Emphasis in the original. For an interpretation that follows Lyotard’s model, and which thus contrasts sharply with my own, see Jeremy Lewison, Looking at Barnett Newman, London 2002. 23. See Richard Shiff, ‘Performing an Appearance: On the Surface of Abstract Expressionism’, in Michael Auping (ed. ), Abstract Expressionism: The Critical Developments, New York 1987, pp.94–123. 24. In order to figure flexible relationships between ideas, images and things, metonymy can (1) transfer the name of one thing to designate something else (as when we use ‘the heart’ to refer to our emotions); (2) substitute a name associated with one quality for a referent (we might disparage businessmen by calling them ‘suits’); or (3) express the immaterial in terms of the material (a ‘flash’ of insight converts the immaterial instant of brilliant ideation to the material phenomenon of a lightning bolt, while ‘puzzling’ over something describes our confused thoughts in terms of a jigsaw). When Newman said ‘That stroke made the thing come to life for me’, the word ‘stroke’ metonymically conflates touch (material) with an instant of time (immaterial), and converts a vibrant streak (immaterial) into a forceful blow (material) that announced to him the painting’s life. For my model of metonymy, see Kenneth Burke, ‘Four Master Tropes’, in A Grammar of Motives , Berkeley 1969, pp.503–17. 26. Barnett Newman, ‘The Sublime is Now’ , in O’Neill 1990, p.174. 27. Mark Rothko and Adolph Gottlieb (with Barnett Newman): ‘We do not intend to defend our pictures. They make their own defense … No possible set of notes can explain our paintings. Their explanation must come out of a consummated experience between picture and onlooker’. Rothko and Gottlieb (with Newman), ‘Letter to Edward Alden Jewell’, New York Times, 13 June 1943, section 2, p.X9. 28. During Newman’s lifetime, the critical distinction to which I am drawing the reader’s attention was articulated rigorously by Michael Fried in ‘Art and Objecthood’ , in Art and Objecthood: Essays and Reviews, Chicago and London 1998, pp.148–72. 31. The first documentary evidence of the title Adam being attached to this painting was at the time of its 1957 sale to collector Ben Heller, but it is possible that Newman considered the title before that date (see note 12 in Michael Schreyach, ‘Scale and Standing’, in Schreyach 2018). 34. Yve-Alain Bois, ‘On Two Paintings by Barnett Newman: Abraham and Galaxy’, October, no.108, Spring 2004, p.4. 35. Barnett Newman, ‘Letters to the Editor (Replies to Erwin Panofsky)’ , in O’Neill 1990, p.216. 39. The antithesis between the old and the new Adam was already conventional by the time of St Augustine. See Gertrud Schiller, Iconography of Christian Art , trans. by Janet Seligman, Greenwich, Connecticut 1972, vol.2, p.130. My summary of the typology of Adam is indebted to Schiller’s scholarship; see especially pp.130–3 and pp.160–4. I thank Jeffrey Chipps Smith for introducing me to Schiller’s work. 40. Mark 15:22; Matthew 27:33; Luke 23:33; John 19:17. 42. Barnett Newman, ‘“The New York School Question”: Interview with Neil A. Levine’ , in O’Neill 1990, p.272. 43. See Michael Schreyach, ‘Scale and Standing’, in Schreyach 2018. 44. Schiller 1968, p.131. The flexible relationship characteristic of the motif in the High Middle Ages (c.1000–1300) – between Adam’s participation in original sin and his redemption as a result of Christ’s sacrifice – hardened, around the time of the Reformation, into an antithesis between the Fall and Salvation. As Schiller goes on to explain, that opposition within Lutheran theology had the effect of making Adam a token of all humankind. Compelled to choose between the poles of sin and grace, the individual was guided by John the Baptist, the intermediary between Adam and Christ, between the Old Testament (the Law of the Old Covenant) and the New Testament (the Gospels of the Evangelists). 46. Newman had made that compositional choice only once before, in Untitled 3, 1949 1949 (private collection). 47. Newman’s last steps would have been to knife on the thick orange band at the left, thereby covering the remaining canvas reserve left over from the initial taping, and to adjust tonal values by brushing and scraping until he achieved the gradient effect he wanted. I thank Richard Shiff, Mark Schlesinger and Kenneth Walker for helping me hone my hypotheses about the manufacture of the painting. 48. The catalogue raisonné lists Adam #2 as one of five alternate titles for the work, not including its official name, Untitled 1, 1950 (see Richard Shiff, Carol C. Mancusi-Ungaro and Heidi Colsman-Freyberger, Barnett Newman: A Catalogue Raisonné, New Haven 2004, no.39, p.220). 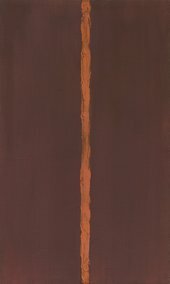 On an insurance policy dated 22 March 1967, held in the Barnett Newman Foundation Archives, New York, all the narrow paintings of 1950 except The Wild are listed with conventional titles instead of according to the Untitled appellations by which they are now known: Eve #2, now Untitled 2, 1950 1950 (Menil Collection, Houston); The Embrace, now Untitled 3, 1950 1950 (Art Institute of Chicago, Chicago), which was misspelled on the insurance policy as The Embrance; The Day, now Untitled 4, 1950 1950 (private collection); and Night, now Untitled 5, 1950 1950 (private collection). I thank Heidi Colsman-Freyberger for bringing this document to my attention, and for her cautionary observation that given such titular variation (numerous works on the insurance document besides the ones I have listed are known by other names), we must bear in mind that the sources for the names may not be entirely reliable. It bears pointing out that Adam #2 (now Untitled 1, 1950) was the canvas that Newman bought back in 1953 from its owner, Alfonso Ossorio, explaining: ‘I have decided to withdraw all of my “small” canvases at this time from public view … The conditions do not yet exist … that can make possible a direct, innocent attitude toward an isolated piece of my work’. (Barnett Newman, ‘Letter to Alfonso Ossorio’ , in O’Neill 1990, p.198.) Newman may have understood that their failure was a consequence of viewers not acknowledging the paintings’ modes of pictorial address. On the technical manufacture of Eve #2 (now Untitled 2, 1950), see Bradford A. Epley, ‘“So Much Mud”: Response and Interplay between Artist and Material in the Late Paintings of Barnett Newman’, in Bradford A. Epley and Michelle White, Barnett Newman: The Late Work, 1965–1970, exhibition catalogue, Menil Collection, Houston 2015, pp.63–77; on the painting’s structure of beholding, see Michael Schreyach, ‘Barnett Newman’s “Sense of Space”: A Noncontextualist Account of Its Perception and Meaning’, Common Knowledge, vol.19, no.3, Spring 2013, pp.364–6. Michael Schreyach, ‘Immanent Iconography’, in Michael Schreyach (ed. 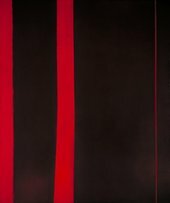 ), In Focus: Adam 1951, 1952 by Barnett Newman, Tate Research Publication, 2018, https://www.tate.org.uk/research/publications/in-focus/adam/immanent-iconography, accessed 20 April 2019.